Editors Note: One of our regular readers, Trebor, mentioned how much he enjoyed that we include references to building code in our Pro-Follows. Understanding and following local regulations are an important part of any home improvement project, and Trebor’s comment reminded me that we have these great instructions for obtaining free access to the 2011 NEC. In addition, here are links for free access to the 2012 International Residential Code (IRC) and International Building Code (IBC), and don’t forget to have underground lines located before you dig. 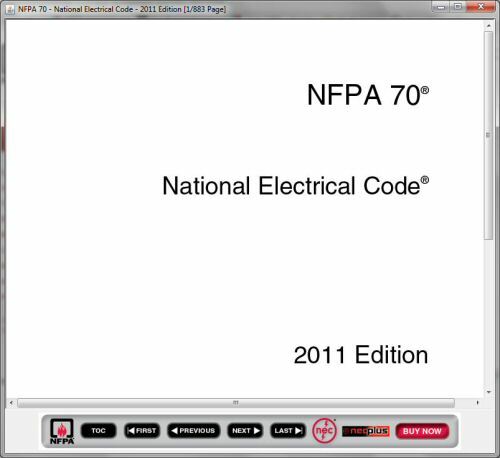 The National Electric Code (NEC) is published by the National Fire Protection Association (NFPA). 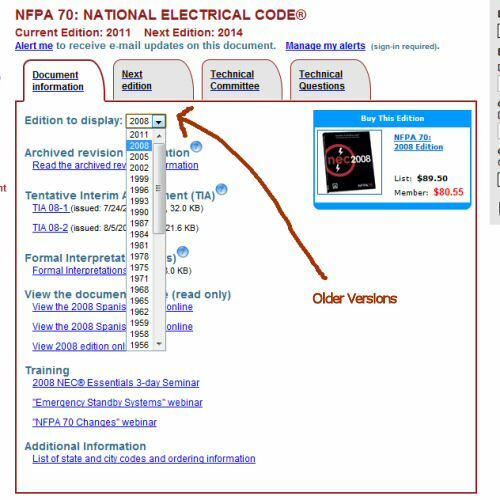 The NFPA recovers part of its code development costs by selling code books. However, they do make available a limited-use online copy of the 2011 NEC. Unfortunately, the NFPA intentionally makes this free online version difficult to find and use. (If the free online version were easy to use, no one would buy the books!) I tell you how to access the free version below. New! If you are a Google Plus User and find this how-to helpful, we would appreciate it if you would give us a “+1” using the button on the left. It tells Google that this information was valuable for us to publish! Before I give you the steps, you should know that the best way to get access to the code for free is to go to your local library’s reference section. Most libraries will have every recent version of the code on their shelves, and you can make photocopies of the sections you need for your job. I actually used this approach for a recent wall oven installation. I didn’t have any cash on hand for the photocopies, so I took photos with my iPhone and printed them when I got back home. It worked great, and our wall oven is installed to code specifications! Many districts will be phasing in the 2011 NEC as their electric code standard over the next few years. You should always check with your local Government to determine what code is enforced in your area. For instance, when I started my basement project in 2007, Baltimore Co. MD was still enforcing the 2005 NEC, but had included several amendments. Some jurisdictions don’t use NFPA’s codes at all. Step 1: Click here to go to the NFPA’s NEC home page. Step 2: Scroll down the page and click View the 2011 Edition Online. See this image for help. If you aren’t already logged in (and you likely aren’t at this point), this link will take you to a login or sign-up page. Step 3: Click the Create an account link. Step 4: Enter your data into the resulting forms. NOTE: Make sure to use a valid e-mail address. You will need to confirm your membership email address before you can proceed. 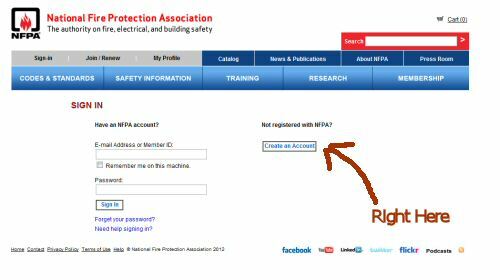 Step 5: NFPA will send you an email to confirm your account. Open the email and click the included verify link. 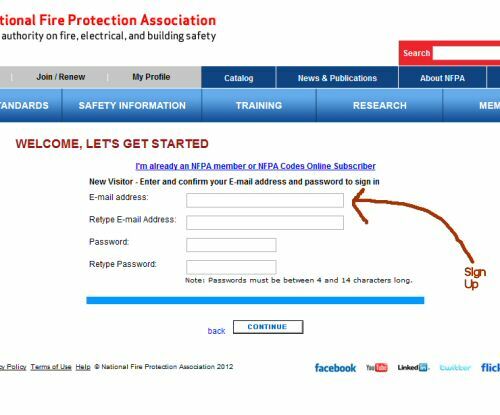 Step 6: Upon completing Step 5, your browser should be taken back to the NFPA site to load the code in a new window. Click the Open link. If your browser does not return to the site, simply go back to the link in Step 1 above, select the link at the bottom of the resulting page for “Read the 2011 online” and sign in with your username and password. You should then be taken to this screen. NOTE: You MUST have JAVA installed to run the plugin that loads the NEC. If you do not have JAVA installed, your browser should prompt you to install it. After you’ve created an account, older versions of the code can be viewed via the drop down box on the code home page. While the NFPA certainly has contributed to the safety of occupancies in the US, from my side of things (the fire service side), they seem to be influenced a little bit by a handful of manufacturers. While local jurisdictions adopt large sections of the NFPA “regulations,” the NFPA is just an association, not a governing body. They have no enforcement powers of their own, and most jurisdictions adopt only what is convenient for them to enforce or easy with which to comply themselves. For instance, most fire departments will comply with NFPA rules regarding the construction and contents of an apparatus, because federal and state grants usually require so. However, there are almost NO departments that comply with the staffing requirements of the NFPA, which would have 5 men on an engine, and 6 on an aerial apparatus. You’re lucky to get 3 and 3 unless you work for huge departments like FDNY or Chicago. Your remarks about the NFPA selling code books is right. They change things sometimes just to make changes. Good point to reiterate in the comments…. NFPA is an association… the enforcement of the regulations is a jurisdiction-by-jurisdiction decision. I know that here in Baltimore County, they don’t adopt new code books until a few years after publication. It saves the electricians from having to buy new books and learn new rules. Good find. Would still like to have a hard copy but seeing as how i’m not a pro (yet) I can’t really justify the 100 bones. Wonder why they charge so much. (other than to make money of course) Can’t really cost THAT much to change a few words/phrases every 3 years and print a new copy. Its not changing a few words in the book that is the problem, its justifying that change, and figuring out that it needs to change. Also, make sure to check your state/county/town regulations, as all different levels can add or remove whatever they want. Joe, I tend to agree with this. To NFPA’s credit, they release major NEC revisions only every 3 years. While much of the book doesn’t change, that is a sufficient amount of time for new “meat” to roll in and be peer reviewed and commented before becoming code. In between major updates, you can get the minor updates for free on the NFPA site, I believe. That’s much better than my college texts, which seemed to be out of date the day after I bought them. Ha. College texts is exactly what I thought of when you first mentioned selling NFPA books. Can you sell the old NFPA books back for a quarter of what you initially paid? My father is a retired master electrician, and I’m sure he will enjoy looking at this. Thanks for this info. Great discussion. Another resource for changes are continuing education providers. Unlike Maryland, which is county by county, a number of states require courses specifically on the changes. So if you are looking for the top 125 changes based on the proposals and comments, you can take a course for free with a provider like us or anyone else out there. The good ones are only pay after you pass so there is no cost up front. You can sometimes, as in our case, download a pdf of changes for free as well. Since you are talking about finding good deals on code books…we ship a code book with tabs for $90, shipping included. You can find our contact information at http://www.jade1.com, or call us at 1-800.443.5233. I hope this helps add some ideas for resources you can use. All I want is a searchable version. I think it would be very helpful for any handy homeowner. Instead we have to settle for searching the Internet and hoping the forum we stumble across has a code reference on the first page and not the 10th page. It’s square-footage based, as well as room-type based. And it is dependent on jurisdiction. Look up receptacle requirements in the code and you should see a lot of guides. But, you’ll always need to check with your local jurisdiction to see if they have any modifications. What does “limited” free access to the NEC mean? 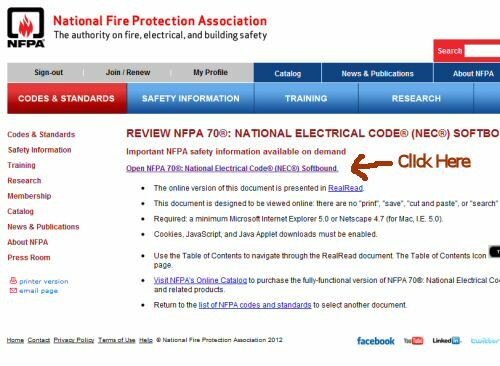 If you follow these instructions you’ll get to an NFPA application that allows you to read the NEC online. However, you cannot search, print, copy, past, annotate, or otherwise manipulate the code. Therefore, while it is helpful for answering very directed questions, we find it far easier to either head to the local library to use the code there, or to just pay for a code book. Hope that helps! Thanks for this. I’m doing a lot of upgrading to my home’s electrical system and I can only ask my brother in law (he’s an electrician) so many questions. I agree that searchable documents would be easier and more convenient. It’s a good resource nonetheless, thanks for sharing. I missed this post first time around, so thanks for reposting. It seems kind of strange to me that it’s such an arduous process to get a copy of the code. I guess they want you to buy it? why no all sizes of electrical cable wire from small diameter size and to bigger size of wire and the current ampacity rating of the wire written in the elec NEC 2008. any electrical technician needs that table to use the correct size of wire and any wiring intallation with out wire size computation and using electrical formula the easy way is you know all size of wire and the equevalent ampere rating. 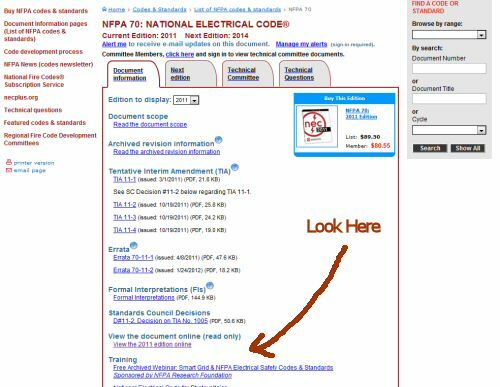 Where can I buy a 2011 national electrical code book at reduced price? I bought NFPA 70 Book for $15 and it was in great quality. What is the min height for a breaker box in a house and the max height also from the 2011 NFPA book? so no search…. why would I use a digital version if I cannot search?!!? Hello, I am trying to help my husband find a 2017 code book at a better price than the stores around our area have them for, and I came across this site. Very helpful and insightful information. I thought, at one time, I had heard one of my husband’s instructors tell him there was a way you could pay for the difference in codes. For instance, he graduated in 2013 so he only had the 2011 code book then. If he were to want the 2014 or 2017 code book, could he pay for just the pages of changes? I asked him if he remembered the conversation with his instructor and me and he said he vaguely did, but he couldn’t really recall any helpful info. If anyone knows if this is true or if you know for certain it’s not true, please let me know. Thank you!!!! !